I am all about the pumpkin & fall flavors at this time of year. 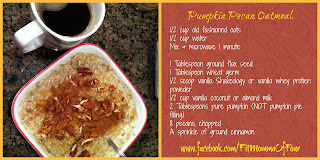 This is quick, easy, & makes you feel like you are eating pumpkin pie for breakfast, but with out all the guilt! Mix 1/2 cup old-fashioned oats & 1/2 cup water. Mix in 1 Tbls. ground flax seed, 1 Tbls. wheat germ, 1/2 scoop Vanilla Shakeology (or whey protein powder), 1/2 cup vanilla coconut milk or unsweetened vanilla almond milk, 2 Tbls. canned pure pumpkin (NOT pumpkin pie filling), 8 pecans (chopped), & a sprinkle of ground cinnamon. For more clean eating recipes click here!